On June 25, 2016, PDA imposed a quarantine on areas where boxwood blight is found. This quarantine could affect nurseries, garden centers, rewholesalers and landscape contractors harboring affected plants. In addition to land area, the quarantine covers equipment, tools and other vectors for the spread of the disease. The Pennsylvania Department of Agriculture has declared boxwood blight to be a "regulated pest." The goal of regulating this disease is to stop its artificial spread by human activities, particularly the propagation and distribution of boxwood and other host plants. · Allows for the quarantine of any property, facility, premise, place or area where boxwood blight is confirmed. · Restricts movement of any material or object that may carry or spread the fungus. This restriction applies to both inter- and intrastate movement. · Requires proper inspection of any material that would enter the commonwealth from another state. That state must certify that the shipper meets commonwealth standards before its plants are allowed to enter Pennsylvania for resale distribution. · Requires businesses within the commonwealth that can meet the requirements of the quarantine order to enter into compliance agreements with the department for clean stock production. In 2011, boxwood plants in the U.S. were found suffering from a new disease, Calonectria pseudonaviculata, boxwood blight. This disease is caused by the fungal species Calonectria, and can result in complete leaf loss and blight of the plant. Other names by which the fungus may be referenced are Cylindrocladium buxicola or C. pseudonaviulate. Boxwood blight has a rapid cycle, capable of being completed in one week and lives in temperatures between 41 – 86 degrees F. The optimum temperature for attack is 77 degrees. Infections occur quickly under warm humid conditions (temps of 64 -77 degrees primarily from July through October). High humidity or leaf wetness is required for infection. Spores germinate and penetrate leaves within 5 hours; no wound is necessary. The disease is dormant November through June. It is necessary to have a laboratory confirm the presence of the fungus to accurately diagnose the disease; it does look like other diseases. The infection will start as leaf lesions/stem cankers. Lesions progress to leaf blight. Sporulation may be visible on undersides of infected leaf during moist conditions. The interior of the plant will be defoliated with healthy foliage at tips of branches. Stem cankers my still be visible. Spores of the fungus can be spread by insects, animals and horticultural tools. Spores can be carried on clothing and hands. Blight can be wind disseminated and also spread through splashing from rain and irrigation and transmitted through diseased plant debris. Spores from diseased material may be in the soil on leaf debris and may be viable for 10 or more years. Currently there are several studies being conducted to determine appropriate treatment methods and resistant varieties. To date no cure for the disease has been determined. Protectant fungicide sprays can prevent healthy plants from becoming infected, but will not cure a plant that is already diseased. Fungicide sprays may only mask the problem until conditions are right for disease expression. If you suspect you may have symptomatic boxwood plants, please contact your local Penn State Cooperative Extension County office. Replanting with boxwood, pachysandra or sarcococca is not recommended, if the previous plants had Boxwood Blight. Even if diseased material is removed and the area cleaned, there are not guarantees the fungus is removed. It is recommended to substitute other plant material. Do not compost blighted boxwoods; spores live for years and will not be destroyed during composting. · A 10% bleach solution or other appropriate sanitizing solution should be applied to tools and equipment between pruning boxwood and after completing all pruning and cleaning. Participate in PDA’s voluntary "Boxwood Clean Program". This program recommends best management practices to limit the possibility of introduction and spread of the disease for growers, wholesalers and retailers. Contact your local PDA regional office to participate. See below for a copy of the Application. 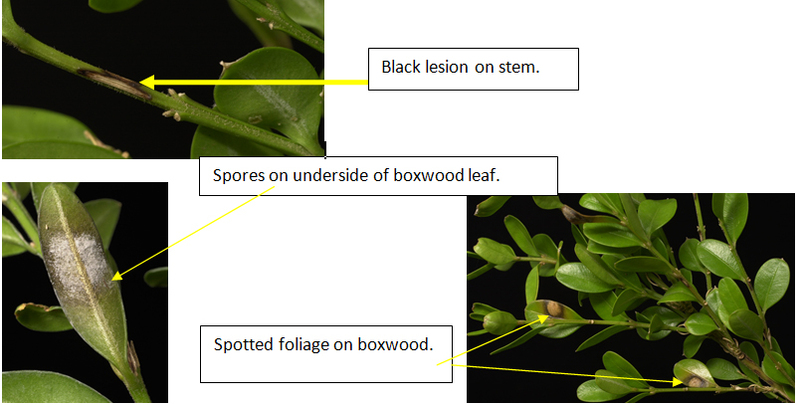 PLNA has created Fact Sheets on the Boxwood Blight disease for your reference and for you to distribute to fellow members of the industry. It is important that the green industry in Pennsylvania do everything possible to prevent any spread of the disease and keep boxwood a viable landscape plant in Pennsylvania. All updates on the disease, possible treatment and prevention measures will be posted here and sent out via PLNA e-News.